No matter how old you are, having an IV inserted into a vein is a pretty scary experience, and it is often painful. 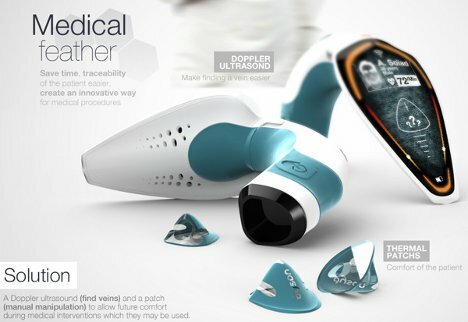 The Medical Feather from designer Adrian Borsoï is a concept that would take a lot of the pain and fear out of the process. Ultrasound technology helps a doctor or nurse find an appropriate vein easily, without the typical poking and potential repeated jabs. After a vein is located, a small patch marks the appropriate spot. 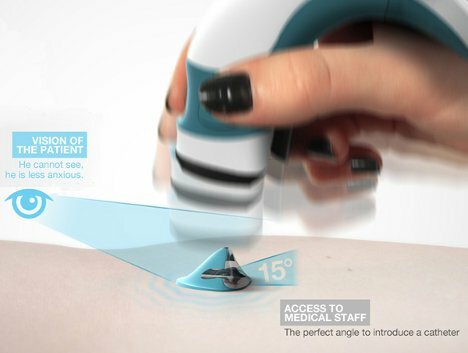 The patch numbs the spot and blocks it from the view of the patient, making the process doubly easier on the person having a needle inserted under his or her skin. 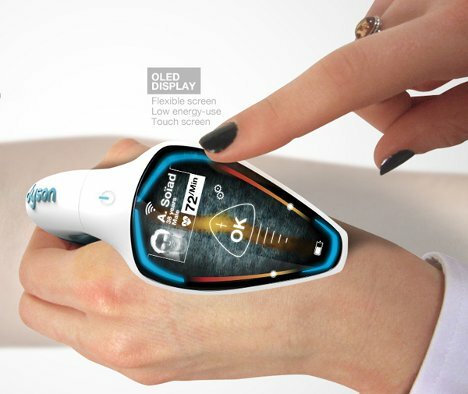 The Medical Feather is a handheld gadget about the size of an ear thermometer that could easily fit into a nurse’s regular IV kit. The designer does not mention a projected cost, but for certain healthcare settings a tool like this could be invaluable. See more in Unbuilt Concepts or under Technology. July, 2012.